Disclaimer: This review is of the edited TV-14 version of the film. All thoughts below should be read as such. A review of the unedited version would likely be even more negative. It’s time for another horror film. Unfortunately, it doesn’t fare any better than the average one. The film may not be afraid of the dark, but it’s also not afraid to step into every possible cliche. There is nothing original or even semi interesting to be found here. Even the villains are very weak and unimpressive. Add in the fact that all of the characters are annoying and you’ve got the makings of a very sad film on your hands. It’s not the worst horror film by any means, but even for a horror title…it’s one of the weaker ones. The film is right about one thing though…the fear is not made up. You definitely feel fear for your attention span while trying to watch this film! Alex and Kim have finally nabbed a large house. As interior decorators, they know how to make the place look attractive and the money can start rolling in. Unfortunately, Sally is staying over for the weekend and won’t be leaving anytime soon. It seems to be related to custody issues and now Alex has his daughter back. She doesn’t like Kim at all though and decides from the get go that they won’t be friends. Tensions continue to rise when Gremlins start to frame Sally for many tricky situations like all of Kim’s clothes being torn up. Can Sally hope to stop these little monsters or will they continue to pull pranks and eat people? The Gremlins are tiny though and they are very weak when it comes to durability. Stepping on one of them is enough to end the fight as shown a few times. A kid can beat them so that kind of destroys the scare factor. They simply aren’t interesting villains either way though. Even if they were physically tougher, the design doomed them to 2nd string status for good. I can’t say that I’m surprised though. 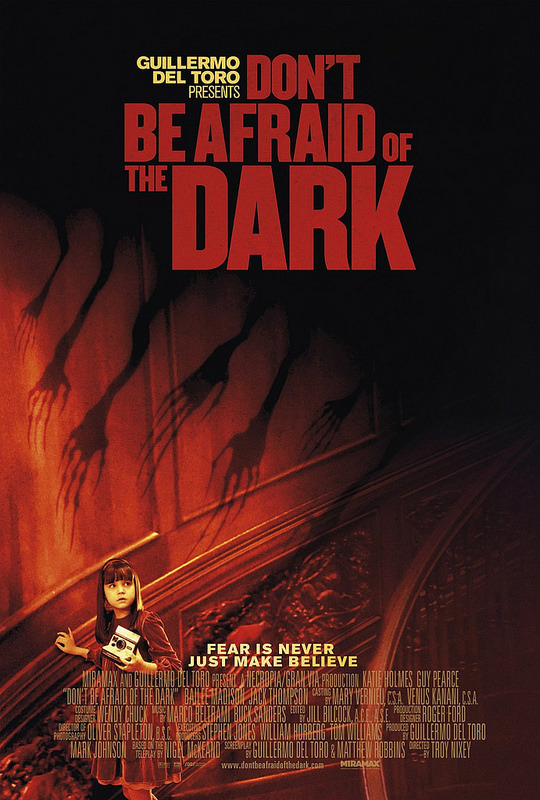 Don’t Be Afraid of The Dark started off on a terrible note right from the get go as we see an old man destroy a maid and then give her to the Gremlins. They decide that the sacrifice isn’t enough though and destroy the old man next. The segment is so terrible and needlessly violent that a 2 was as high as the film was going to get by that point. No need to make it so dark as to have the Gremlins eat teeth, they could have settled for soul snatching or something like that. The action scenes are all pretty terrible in the film as well. Since the Gremlins can’t fight, they have to grab scissors and other blunt objects to attack with while Sally uses her Camera to retaliate. Watching Alex also lose to the Gremlins was pretty sad. For a horror film, there surprisingly aren’t many “scare” scenes, but I suppose they were hoping that seeing the Gremlins was enough to achieve that effect. They certainly did do a number on the local Gardner who tried to hide the secret of the Gremlins. Why was he hiding them? I dunno, seems like a terrible move on his part since he could have helped to avoid the whole situation. The ending is also pretty terrible. Kim decides to help Sally out and fights the Gremlins while Alex gets knocked out again. They eventually overpower her and throw her to the underworld where they are. Alex watches and then decides that he won’t risk his life to save hers. I mean, they were a couple and you’d think that risking his life for her is something that he’d do without a second thought, but clearly Alex wasn’t quite that brave. He was already a very unlikable character, but that didn’t help matters. As for the film ending on that really tragic and sad note…it didn’t help the film’s case either. We’re already discussed how Alex was unlikable. He kept putting the job ahead of his kid. Sally was also on the annoying side since she had a sour attitude from the start and it is part of the reason why Alex doesn’t believe her when she denies being responsible for the mayhem that the Gremlins start. Kim’s really the only reasonable character here as she tries to get along with Sally, but she also didn’t help the situation too much at times. Considering that the place isn’t soundproof and Sally is right next door, she should have probably held off on the “fun times” with Alex for a little while. That’s not going to win her any brownie points with Sally. Even once Kim realized that the Gremlins were real, she sure took her time doing anything about it. At least she finally began to pack, but still left Sally by herself for a while. Not a good move since Sally was the main target the entire time. No reason why Sally can’t just follow Kim around right? They still may not have been able to defeat the Gremlins since they kept making rookie mistakes, but their odds would be better. Just don’t go to their home base where they have extra power….it wasn’t a wise move. Of course, they were dragged there, but it just goes to show that numbers are important. If only they could have convinced the guests to help out, but the Gremlins know better than to show themselves while the guests are there right? Well…they actually didn’t care. They attacked even with the guests present, but somehow they weren’t spotted. These Gremlins certainly weren’t the smartest villains out there, but I guess they got the job done anyhow. There isn’t really a soundtrack here although the opening credits theme wasn’t bad. Having one decent tune is actually more than I would expect from this title. Nothing else stands out about the film when it comes to the technical aspects. Overall, Don’t Be Afraid of The Dark is your average horror film. It grabs all of the cliches like evil old men, random bath scenes, fanservice, terrible jump scares, excessive violence, sad ending, and throws them all together without any real subtlety. The characters make all of the wrong decisions like you would expect and the cast is fairly unlikable. Kim was the only decent character and she’s still not great by any means. In case it wasn’t too clear from the review, I heavily recommend avoiding this film. There’s nothing to be gained from watching this title and even among horror films, it is simply terrible. If it ever gets a sequel or a remake, my advice would be to make it 20 minutes long and see if the writers can use that as an excuse to cut out all of the sad cliches. The shorter the better is always my recommendation for horror movies. This entry was posted in Live Action Movie Reviews, Live Action Movies, Reviews and tagged Don't Be Afraid of The Dark, Film Review, Gremlins, Horror, Movie Review, Review, Thriller by dreager1. Bookmark the permalink. Did this film scare you? Nah, this one wasn’t scary.